This tried and tested wet room tanking kit allows safe installation of wet rooms to timber and concrete subfloors especially in upper floor situations. The tanking kit includes a hidden shower tray with built in falls that can be secured directly onto the joists, making sure the hidden tray is flush as possible. With the supplied 6mm waterproof tanking board, this secured using a good quality flexible tile adhesive to the rest of the bathroom. The next stage is for all the joints between the individual tanking boards, walls and hidden tray to be made watertight using the supplied industrial high grab tanking sealing tape. The floor is now ready to be tiled using a flexible tiling adhesive and normal tiling practices. Our wet room tanking system uses tried and tested commercial industry materials and therefore comes with a manufacturers 15 year guarantee. 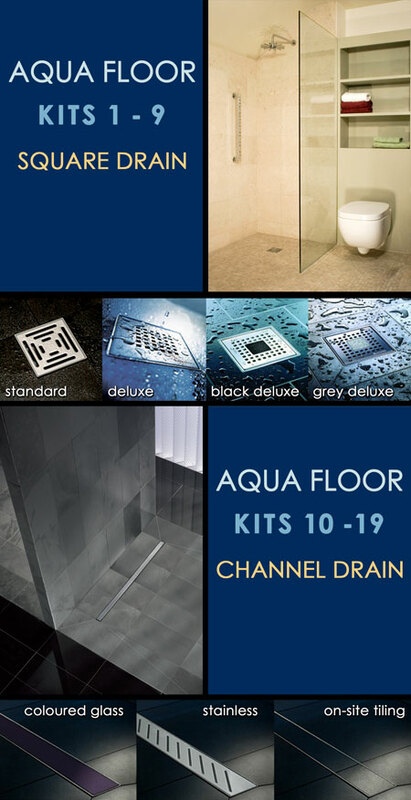 The wet room tanking system consists of a hidden flush shower tray, a large diameter drain waste with a great quality stainless steel grill, 5m2 or 9 m2 of waterproof tanking boards which has good thermal properties, tanking sealing tape, tanking putty and full fitting instructions. This wet room shower kit is relatively easy to install thus allowing quick installation. Contact 01722 415000 for technical.